Google shows no signs of slowing down when it comes to expanding the utility of Chrome OS as a platform. We're already convinced that the operating system can be used to do real work—at least, in our workflow here at Android Police—but more useful features are still being added with each new version. 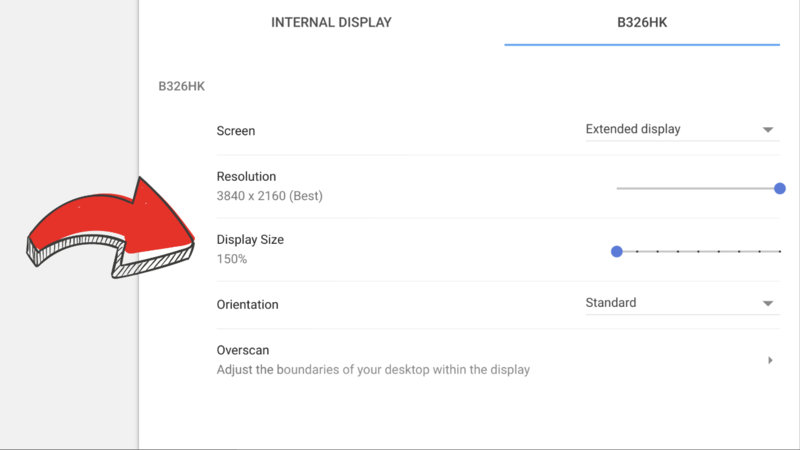 The latest addition to the Chrome OS Dev Channel is a "display size" setting for external screens. Currently, only a few Chromebooks support proper display scaling on the internal monitor, but it's not actually user-facing. On some devices (like the Pixelbook, Chromebook Plus/Pro, and ASUS Chromebook Flip C302) adjusting the resolution to specific values results in scaling. Some of them even come with a scaling factor configured out of the box. For most other devices, selecting a larger or smaller resolution actually changes the resolution being rendered, with content simply being stretched or shrunk to fit, resulting in a blurrier experience. So while it's cool to see Google building out a display size scaling option for external displays, it would be nice if they also gave all devices this same degree of control when it comes to internal screens, too. If your Chromebook is on the Dev Channel, you can enable this new option by tweaking a new flag (chrome://flags/#enable-display-zoom-setting ), which will cause the new Display Size setting to appear for external displays in settings.